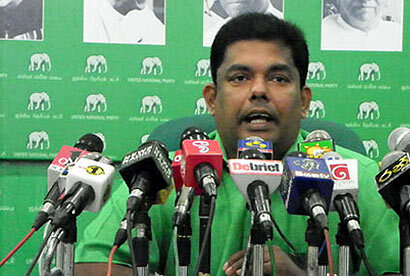 Despite widespread objections, the government extended the period of detention of suspects, without being produced in court, to 48 hours, but the rule did not apply to Ministers’ children, the UNP said yesterday. Health Minister Maithripala Sirisena’s son had assaulted the Batticaloa DIG Ravi Waidyalankara’s son on the Passekudah beach on Sunday, but he had been released on police bail shortly after the incident had taken place, UNP Media spokesperson Gayantha Karunathillake told a news conference in Colombo. He said that the lightning speed with which Srisena’s son was released from Police custody only went to show that there were different yardsticks for the general public and the VIPs in the Rajapaksa regime. If a member of the public had dared to hit a Minister or his kith and kin, that person would not only have been detained for 48 hours, but also produced in court with an adverse ‘B Report’ that would have made it difficult for the suspect to obtain bail, the MP observed. Karunathillake said that as SLFP General Secretary, it was the duty of Sirisena to maintain discipline, but the party would now have to appoint someone else to control his family. The leaks in the underground oil pipelines have not been fixed properly and the losses were mounting. So were the outstanding bank loans, the MP noted.